Four weeks into the semester, I've successfully worn a different hairstyle for each day of class -- that's 14 days out of 45. My goal is to wear a different hairstyle every day I teach. I'm sharing on Instagram, where you'll find me @runningfan63 and on Twitter @paulitakincer. 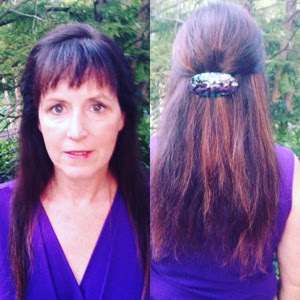 If you want to hear more about my crazy scheme, you can find the original post on my blog A Professor's Hair Diary. "Did you get a haircut?" a male student who hadn't been in class for more than a week asked me. 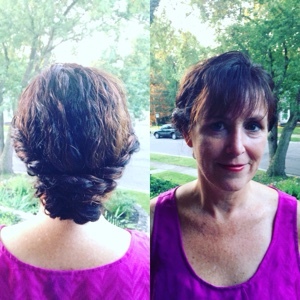 "No, my hair is up," I said, turning around for him to see the back. And that is as close as I got to a student noticing that I have warn my hair different every day of the semester so far. On Monday, I wore a bubble ponytail. That's a pony tail with extra ponytail holders so that a bubble of hair is created between each one. Fat braids or ponytails are in this year, so any time you make a braid or a bubble, you are supposed to tug at it to make it fatter. 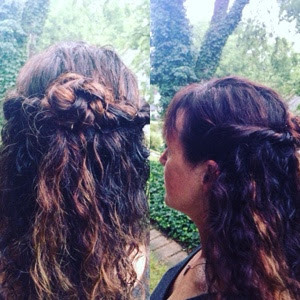 On Wednesday, I braided the sides and connected them to a braid in the back over my waterfall of wavy hair. 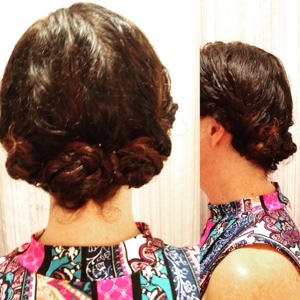 On Friday, I created a braided bun with three braids, each of them pinwheeled next to each other at the nape of my neck. I also twisted the sides before braiding them. One more week down. I'm almost a third of the way done for the semester. busy. 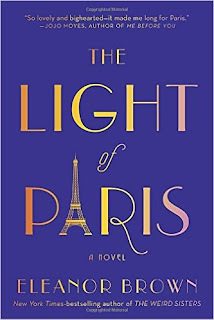 I'm truly enjoying Eleanor Brown's The Light of Paris. 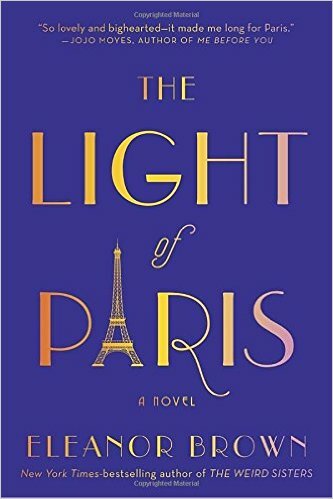 She has some lovely passages as she tells the story of Madeleine in 1999, a woman in a sterile marriage living in a Chicago high rise with her powerful husband, and that of her grandmother, Margie in 1924, who travels to Paris as a chaperone to her younger cousin and decides to stay. 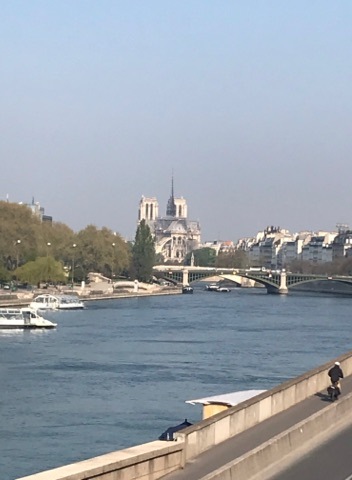 I love traveling back in time and to Paris during that time after World War I as artists, writers and philosophers tried to make sense of the world. I had the best of intentions, always: to make my mother happy, to keep the peace, to smooth my rough edges and ease my own way. But in the end, the life I had crafted was like the porcelain figurines that resided in my mother's china cabinets: smooth, ornate, but delicate and hollow. For display only. Do not touch. 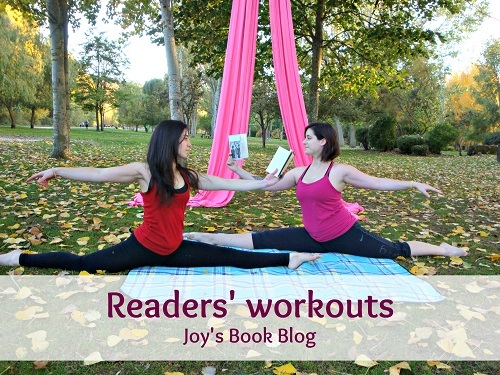 Hope you're reading something fabulous and have more reading time than I do. 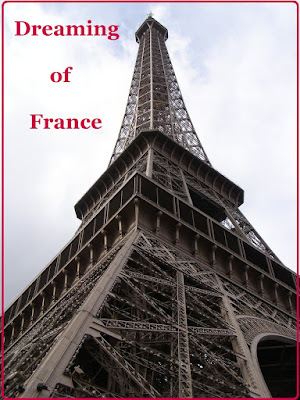 Since Grace is in Europe this week, I thought I'd revisit a time when my boys were in France. 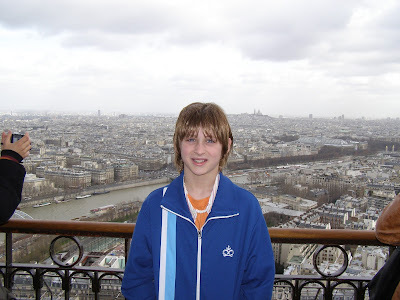 Here is Spencer, age 12, on the Eiffel Tower with Paris at his back. 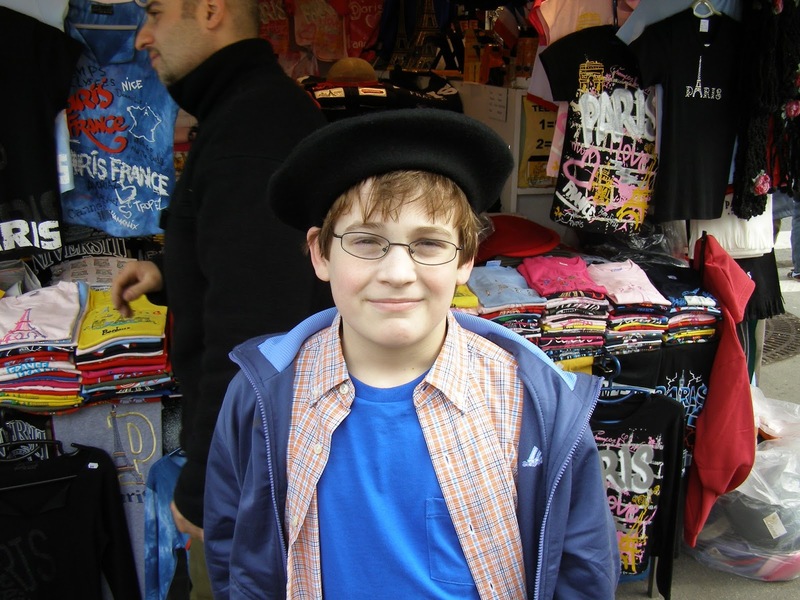 A fashionable 12-year-old in 2007. Note the soccer jacket and the puka shell necklace, plus the still wet hair. over at ages 2, 4, and 6, only Tucker went to the top of the tower with me. And here's Tucker as a 10-year-old wearing a beret that we bought at a souvenir shop. We still have that beret! Hope you're thinking about good memories of France today, too. Four weeks into the semester, I've successfully worn a different hairstyle for each day of class -- that's 11 days out of 45. "Did you do something different to your hair?" the garrulous student who sits in the front row called out at the same time that another student said,"Your hair looks nice." Finally, during Week 4, my students had noticed and commented on my hair. Unfortunately, it didn't have anything to do with an elaborate hairstyle, like the kinds I'd been wearing for four weeks. The comments came the day after I got a haircut and the stylist straightened it. I would have gotten a comment from a student even if I'd worn my hair the exact same way every day - down and curly. 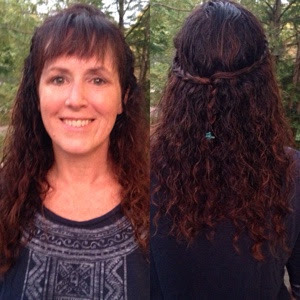 My hair is generally just below my shoulders when it's curly, but it reaches to the middle of my back, past my shoulder blades when it's straightened. Sometimes I feel like it's choking me at night as strands get wrapped around my throat. So, after four weeks of hairstyles, my students noticed a difference, but they haven't noticed all the carefully sculpted hairstyles -- a different one every day. Technically, the comment, "Did you do something different to your hair?" is kind of insulting since I've done something different every day. 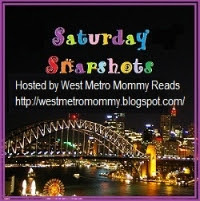 Here are the pictures from this week. Monday I wore a side bun. 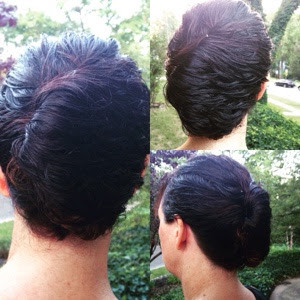 I rolled the sides and gathered my hair into a bun on the right side of the back of my head. 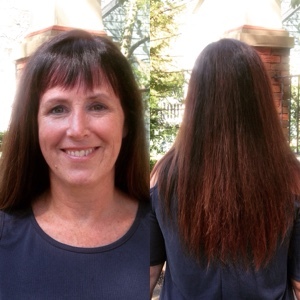 On Wednesday was the noticeable straight hair. 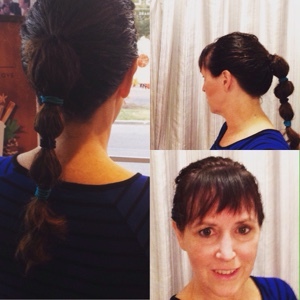 On Friday, I tried four or five different hairstyles before I ended up just pulling the sides back in a barrette. That's it for this week's Professor's Hair Diary. Thanks for hanging around. I hope I can stick to it. I may be losing enthusiasm. 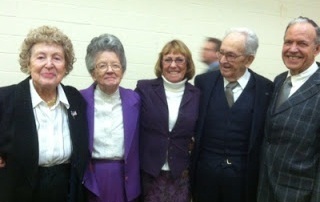 Yesterday, I wrote about my Uncle Junior before attending his visitation service last night. My Aunt Esther valiantly perched on a stool by my uncle's coffin throughout the evening, not leaving her post for two hours as the line stretched through the room. She made each person there feel a specific part of her life and my uncle's life. "You know each niece and nephew is loved, but there was always something special about you," she confided. She even asked, as she squeezed my hands, when she was going to get a copy of my latest novel. I promised I would hand deliver it in the next few weeks. I spent the night at my brother's house, but drove home before the funeral because I had to teach. Just a little while ago, my mother texted the sad news that Aunt Esther fell and broke her leg last night. She did not make it to her husband's funeral because she needed surgery. I can't imagine the pain and indecision her children faced as they tried to decide whether to postpone the service since their mother couldn't be there -- whether to be at their mother's side or their father's funeral. I hope Aunt Esther heals quickly, even though she faces some sad times without Uncle Junior by her side. 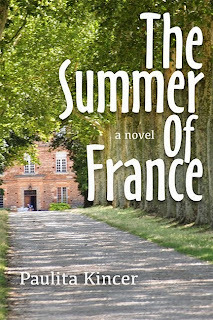 When I wrote The Summer of France, I included the character Uncle Martin. Uncle Martin came from a family of nine children in Kentucky and volunteered to fight in World War II. He fought in Italy, was wounded and ended up in France where he fell in love with a Frenchwoman and never returned to live in the U.S.
Uncle Martin's character was loosely based on all of my uncles, but mostly on Uncle Junior. That's what we called him because my mother always called him Junior. His wife called him Luther because that was his name -- Luther John Phillips. Junior was the oldest boy in a family of nine. He had two older sisters, three younger brothers and three younger sisters. My mother grew up the baby in that family. Uncle Junior was drafted into the army and he did serve in Italy in World War II. Somewhere, I have a videotape of him sharing his war experience. He was wounded four times but came home in one piece with a Purple Heart. As we talked about his experience, he recalled that he warned his younger brothers not to wait to be drafted. Instead, he urged them to sign up for the military. Clarence, the next oldest brother, signed up for the Navy so he could avoid the ground war that Uncle Junior faced. was taken at the funeral of my most recent uncle who passed. These are the remaining siblings. His two younger brothers weren't old enough to fight in World War II, but they both served later. Uncle Junior died at age 94 on Saturday morning. He had been moved to hospice care about 24 hours before. His death makes me sad for my mother, who loved hearing from her big brother. It makes me sad for my aunt, who had been married to him for 71 years. 71 years? Can you imagine how empty that must feel after so long together? And it makes me sad for all of us nieces and nephews who enjoyed hearing his musings, even if we only saw him a few times each year. Uncle Junior didn't have the same adventures that Uncle Martin did in The Summer of France, but he had a rich life that took him back home to Ohio and allowed him to volunteer in the Masonic Order and the Shriners, along with telling his war stories. Sometimes, I think people who speak another language use a word in English when they don't really know the impact of it. Here's a photo to illustrate this point. Can you imagine a store in the United States putting this word on its shop window? Grace has a t-shirt with this word on it and we caution her to wear it inside out. I figure that this shop owner probably spoke French and knew what the word meant, but maybe didn't understand its shock value. I'm sure it isn't shocking to the French, just like the British use of the word "bloody" seems not very profane to us in the U.S. When a French teenager was staying with us, he would say "shut up." I had to explain that the words "shut up" were considered rude and we wouldn't say them, even to children. I offered him the words "be quiet" instead. Have you heard people who speak another language accidentally use bad language in English before? I'm sure everyone has a story. Three weeks into the semester, I've successfully worn a different hairstyle for each day of class -- that's 8 days out of 45. My goal is to wear a different hairstyle every day I teach. I'm sharing on Instagram, where you'll find me @runningfan63 and on Twitter @paulitakincer. If you want to hear more about my crazy scheme, you can find the original post on my blog A Professor's Hair Diary. 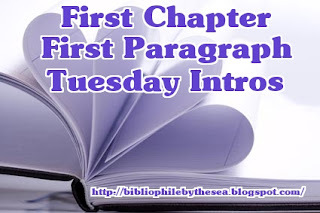 And the first week post at Week 1. I thought I'd catch you up on the past two weeks. Week Two we only had class two days because of Labor Day. 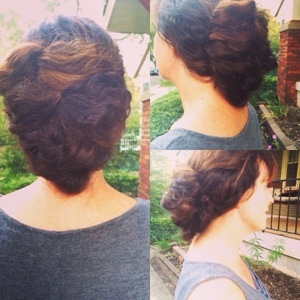 Grace did this side-braided bun on Wednesday. Then on Friday, she twisted the sides and created a rose in the back. Next we moved on to Week Three on Monday. This is a braided headband. As I look at all these pictures of my hair, I realize that parts of it have really gotten redder or lighter from the sun. Never fear, I'm going to the hair stylist next week and she can hopefully rectify that. This is the first day I've had to do my hair myself because Grace left for a trip to Dublin and London. I fell back on a traditional French twist. The filter I used on instagram makes it look a little purplish. 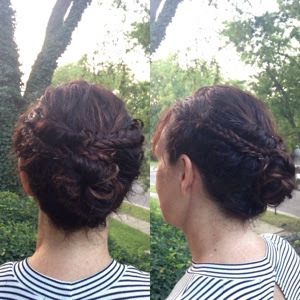 On Friday, I tried a complicated, basket-weave type hairstyle. Because my hair is curly (or because I did it wrong?) it doesn't look the same. Basically I created four pony tails on the back of my head and tucked them through, then separated them and curled them under at the sides. It looks a bit of a mess, doesn't it? Here's the original photo of what it should have looked like. But you can see she did it on a mannequin and I don't have mannequin hair. I get my hair cut on Tuesday and since she usually straightens it, I could try this hairstyle again and see if it is more successful. Or would that be cheating to use the same style? 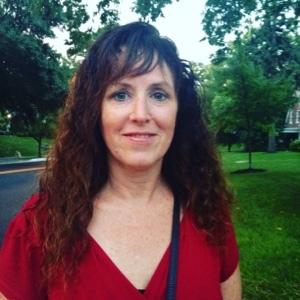 When I finished working on my hair that morning, I felt like I'd had quite a workout. After three weeks of different hairstyles, none of my students have noticed or said anything, including four students who had me for class in previous semesters. I did have one student who told me she liked my hair when I wore it in the French twist, so at least she noticed something. Visiting Toronto itself might be a good idea, but booking a flight in and out of Toronto when flying to Europe and living seven hours away, is not the wisest move. Tuesday morning, on my day off, I drove with Grace and her boyfriend to Toronto.They were going to catch a plane and they saved about $500 each on the flight leaving from Toronto instead of here in Columbus. So that's a $1000 savings, probably worth it for them. The drive to Toronto is nice enough, north through Ohio, along Lake Erie through northern Pennyslvania before a sharp left turn at Buffalo, New York. Then we crossed the border into Canada. The Canadian border guard was a little sterner than I expected as he questioned Grace and Jack about their flights and how long they would be in Canada. Are there Americans trying to sneak into Canada? I mean, there might be now that Trump is threatening. And I can promise that they plan to keep us out, judging by this guard. He made Grace answer since she sat in the front passenger seat, but she had already taken two anxiety pills since she's afraid of flying, so her answers might have been a bit slurred. He shushed Jack who sat in the back seat. 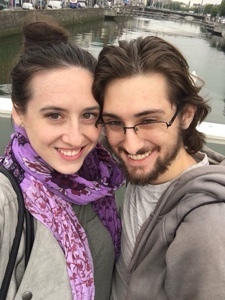 After he assured himself that I planned to leave the country the same day (no, I'm going to sneak and spend the night at a Canadian strip mall), he let us pass. That's when my driving nightmare increased. Maybe it was the directions that Jack's phone gave us. We traveled a myriad of roads where I had to exit and then exit again and then stay to the left at the V. The roads had names like QEW rather than I-90. Plus, Canada is on the metric system, and the speedometer only told me how fast I traveled in miles, so I drove much more slowly than I might have in the U.S.
And all of it looked so much like the United States, an awful lot like Buffalo. Industrial and strip malls. I think I passed three outlet malls in my ninety minute foray into the country. I didn't make it into Toronto proper, which I'm sure is a lovely city. Plus, I saw no moose or polar bears or even Mounties, things that make Canada enjoyable. I dropped Grace and Jack at the airport. Luckily, no one yelled at me while I dropped them off, and then I got back on the highway to head south. The gas gauge edged toward zero. It got to the bottom section where it turned red. Then half of that section disappeared. I stayed in the right lane, hoping each time that I'd see a tell-tale sign of a gas station or an exit sign that indicated I could find something other than diesel. I finally pulled off an exit where there was road construction that sent me through a Walmart parking lot, past a Home Depot and into a Tim Horton's that had gas pumps. I nearly cried when I finally got to the U.S. border. A laissez-faire border guard asked me how long I'd been in Canada and if I'd bought anything. I told him I stopped at Tim Horton's. He let me go. 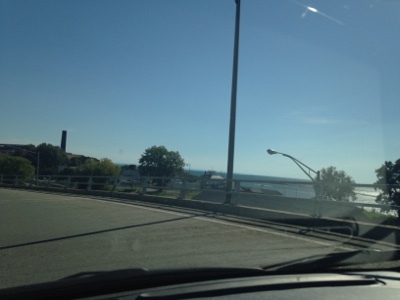 You can't tell it, but the lake looked really pretty here as I pulled into America. And I drove the rest of the way as the sun set over Ohio, getting home around 9 p.m. Meanwhile, Grace and Jack got on a plane, and only a few hours after I arrived home, they landed in Dublin. At least I don't have to pick them up from Toronto. As my daughter Grace prepares for another trip in Europe, this time to Ireland, England and Wales, I dug into some photos from a previous trip to France. The skies were unbelievable clear when she and my husband ventured to Normandy. 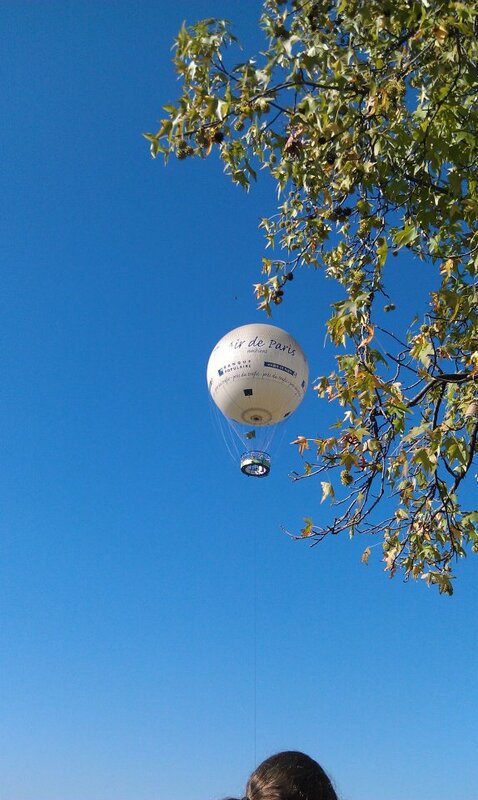 She captured a shot of this hot air balloon. 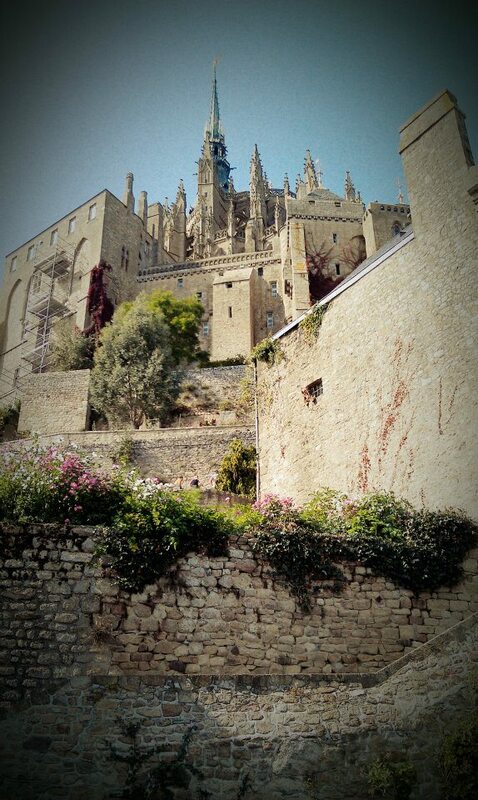 Then she took this picture of Mont St. Michel, the abbey that is sometimes on an island when the tide comes in. 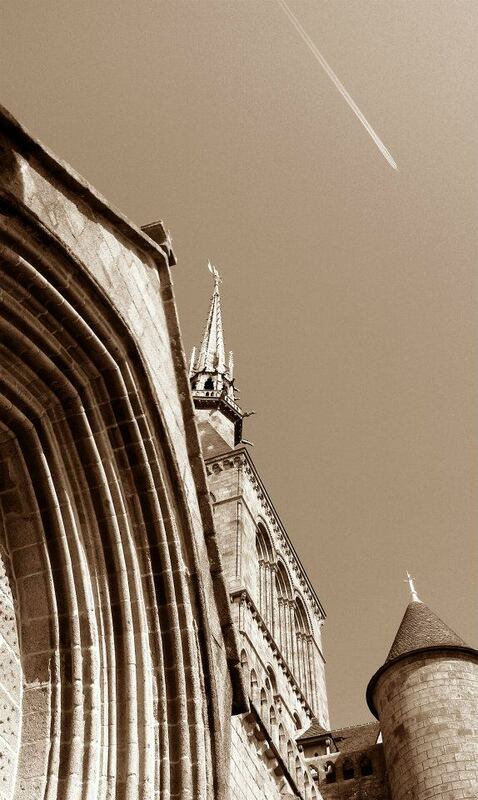 And here's a detail shot of Mont St. Michel with a plane flying overhead. I hope your weather is as clear and beautiful as it is here and that you are having some beautiful dreams of France. One of the universities where I teach is getting rid of all of its hard copy books. I know, it's hard to imagine. It's going to make the spacious room a commons area for students to gather, and instead of books, it is putting emphasis on the online collection. That meant that today, I got a chance to peruse the library collection and take any books that I wanted. Of course, being a university, the emphasis was on reference and textbooks, but I still found some classics and picked out books that I thought my husband, my son and my daughter might like. My husband got a collection of Edgar Allan Poe stories plus great American Mysteries. My daughter is getting ready to fly overseas, so I grabbed a copy of Tender is the Night, a book I read on the beach in Corsica many years ago. I hope she'll read it and leave it where someone else can find it to read. I also found a book called A Year in the Life of William Shakespeare that should be fun while she travels around England. 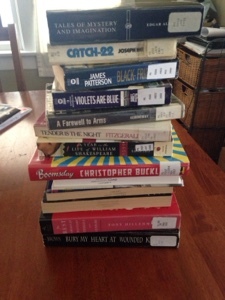 For my son, I figured he needed a copy of Catch 22 all his own, plus some James Patterson novels and A Farewell to Arms. I took Boomsday by Christopher Buckley for me and Bury My Heart at Wounded Knee, which I haven't read, but figured would be fitting because of the Native American protests going on now. A library without any books is sad. I'm glad I grabbed a few that will be read and passed on to others. 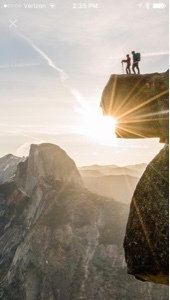 Just last week, I found out that Fitbit had added challenges that allow the reader to virtually hike trails in Yosemite. 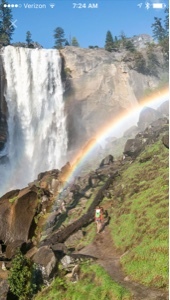 The first trail was 15,000 steps to Vernal Falls. The second 24,000 steps to Valley Loop. And the third, the one I'm "walking" now, is the Pohono Trail, 42,000 steps. 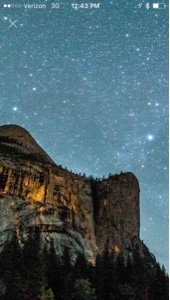 As I walk steps, the Fitbit counts them and tells me where I would be along the path if I were walking in Yosemite. 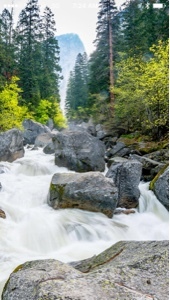 My husband pointed out that the hike would be much more vigorous in Yosemite, which is true, but it's nice to reach some virtual landmarks and see gorgeous pictures of the scenery when I do. 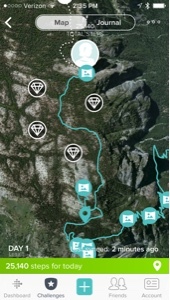 The map shows my progress, and if I click on journal, it shows me photos of landmarks. I can pan to the left or right with my phone to see more scenery, as if I'm really standing on a precipice looking at the breathtaking mountains. The first day I started, I thought that I had to complete each challenge in one day, but that isn't true. The challenges can be broken up into a couple of days and the Fitbit just keeps moving me down the trail. I hope Fitbit comes out with more challenges, and they don't have to be rugged hikes. How about some Paris walks that let me know when I reach Notre Dame or The Eiffel Tower or even Montmartre? The places I would love to walk, even if I'm still in Ohio. Hope everyone else is having a day full of exercise and good energy. The other night as I was walking along our small town's main street, I paused to admire all of the restaurants with outdoor tables. Some of the restaurants had no one sitting outside, even though the weather has turned lovely -- cooler temperatures, lower humidity. It made me think of the techniques used in Paris by hosts and waiters as they tried to lure diners. My husband and I always enjoy visiting Rue Mouffetarde in Paris, and the small streets leading toward Rue Mouffetarde are filled with restaurants anxious for customers. Like many Americans, we tend to head to dinner earlier than the French, so we paused to look at the menus posted on boards and written in chalk. This restaurant off Rue Mouffetarde has a menu du jour for 14 Euros! Probably three courses for 14 Euros. But, since there were no diners seated at the table, the manager or host stood outside his door and offered us a free drink if we'd join him for dinner. So we did. And, his efforts were correct. The more people who sat down outside, the more people were enticed to the restaurant. Some remained empty while others filled up. The restaurants in my small town could learn a thing or do. And that's what I thought about as I sauntered down the street, no waiters or hosts trying to lure me to an outdoor table, the tablecloths gently rippling in the breeze. Here I am on the last day of the first week of the semester, having completed three days of classes with three different hairstyles. 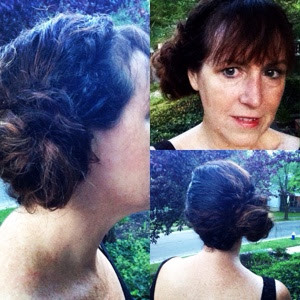 I figured that each Friday, I can summarize the hairstyles here on my blog. I started on Monday simply wearing my hair down and curly. I always straighten my bangs because they drive me crazy. 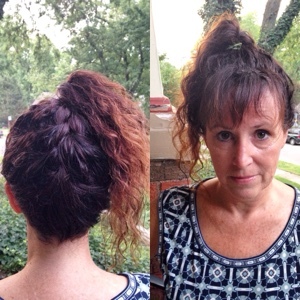 On Wednesday, I dragged Grace out of bed and had her give me an upside-down braid that ended in a curly ponytail. 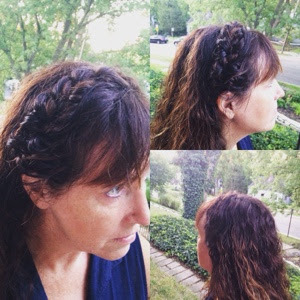 The braid was a French braid and might have stood out more if was a reverse French braid, with the hair going under instead of over. Funny thing, that's how my mother learned to braid, so whenever she braided my hair, at my request, she braided it under long before it became popular. By the time I finished teaching around 2 p.m., my head was aching from the braid pulling on it. I took it down as soon as I got home. Today, I rousted Grace from bed again and she created a twisted tuck bun. 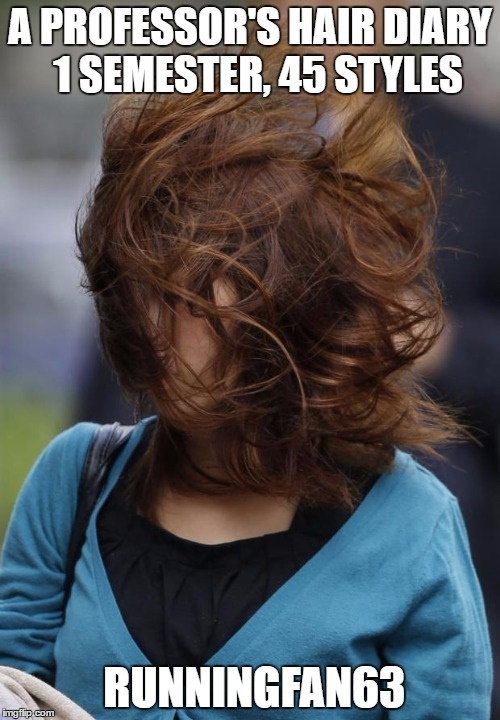 None of my students have mentioned my hairstyles, but a student in the elevator gushed about my hair. And several of my colleagues admired today's style, giving me a chance to invite them to follow me on Instagram and Twitter. They immediately began to doubt that I'll be able to find 45 different hairstyles throughout the semester. Time will tell. Also, Grace downloaded an app to my phone that allowed me to show two pictures simultaneously. I'm definitely learning from this experience. I'll update you again next week.